Heimdall is the sentry and the guardians of the gods. As watchman, he guards the bridge Bifröst against the approach of the giants and other enemies of the gods. But Heimdall is a mystery to the modern reader. The surviving references to him conflict with one another and are confusing. Heimdall is the son of Óðin and nine giantesses. The nine combined to bring forth one son: Heimdall. 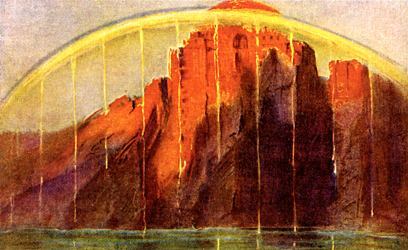 Heimdall guards the rainbow bridge Bifröst which connects Ásgarð to Miðgarð. The gods were worried that the giants might someday try to enter Ásgarð over the bridge. They considered appointing a guardian to watch the bridge, and they hailed Heimdall as perfectly suited. His eyes are as sharp as an eagle's. His ears are keen enough to hear the grass growing in Miðgarð. And he requires less sleep than a bird. As guardian of Ásgarð, Heimdall is outfitted accordingly. He has the horn Gjallar, which he is to blow whenever he sees the enemies of the Æsir approaching. Heimdall has the horse Gull-top (Gold tuft), which carries him back and forth across the bridge. 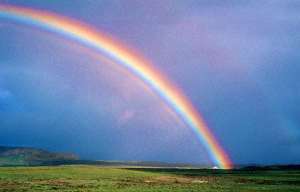 Heimdall's hall is located at the highest point on Bifröst, where he can see every part of the bridge. Heimdall wears white armor, which is considered highly suited to him, since the Æsir consider him to be among their most handsome and most wise. 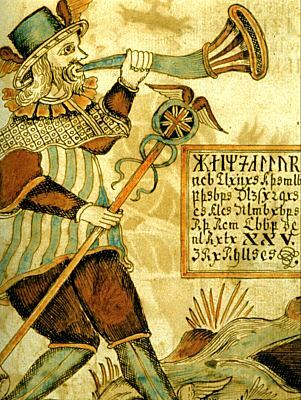 The poem Rígsþula tells how Rígr (who is believed to be Heimdall) became the progenitor of the races of man, and other stories refer to men as "sons of Heimdall". There is the very curious kenning "Heimdall's head" meaning sword. It is obvious that stories about Heimdall have been lost; Heimdall's tale is told in the poem Heimdallargaldr, to which Snorri Sturluson refers, but which is not believed to have survived. Loki and Heimdall are traditional enemies. There are references to Heimdall having battled against Loki. A poem fragment paraphrased by Snorri says that while fighting over Freya's fabulous Brísingamen necklace, Loki and Heimdall became seals and struggled in the water. 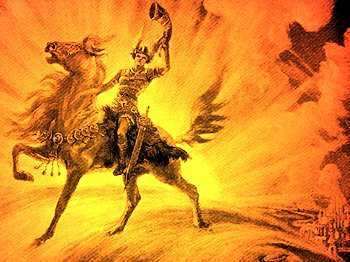 On the day of Ragnarök, Heimdall will summon the Æsir to their last battle with a blast from the horn Gjallar. In the ensuing battle, Loki and Heimdall will kill each other.